I had an amazing time, walking among the locals and through the market. it was great! I enjoyed the shopping. Lunch was ok. I was disappointed that the guide allowed a few guests to sit down and have breakfast at the biscuit shop while the rest of us waited in the parking lot 20 plus minutes. 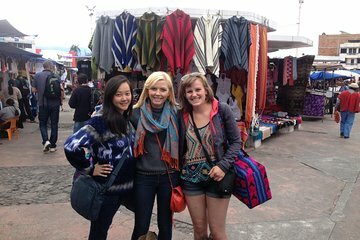 The extra time spent there meant less time at the Otavalo market before it started raining. The hike was not so much of a hike but a visit to historic cultural sites. I wished I had known that prior to opting out because of the rain. If I had known there was more then just a walk in the rain I would have participated. I would not recommend it for any real traveler, unless you want to spend all day on a bus with short shopping spree. We had many short and longer stops at various shops/restaurants, where we could just buy something... We only spend 1 hour at the Otavalo market and ome 15 minutes at Laguna Cuicocha visitor center it was raining, but we even didn't get the option to walk a little- we had to continue to our next stop- lunch. The last stop at leather market for an hour didn't make any sense at all. The guide was nice and knowledgeable, but the trip is not worth the money. Our tour was a little different in that we did not go to the Laguna, but we did the real equator site, Otavalo market and a late lunch in Cotacachi. Omar was a good guide and it was a very full and interesting day. Thank you! Otavalo is where we bought the souvenirs for our trip. However, most of the items could be found in Quito. Plan on bargaining over the price. The breakfast in Cayambe was good. If you plan on buying leather products Cotacatchi is the place to shop for all types of products. The lunch was amazing with soup, main dish, and dessert. The boat ride around Cuicocha Laguna gave us a view of some birds and trees around the two islands in the Laguna. Nice places to see if you love nature and great views, only recommend that the time spend in the market should be shorten when is not in weekends as the options are fewer.